Born January 12, 1887, Sabinal, Texas, second child of Asa Jones Gailey and Sue Louise Connally. Died January 14, 1989, Topton, Pennsylvania. Married 1908 to Dr. Orville D. Wescott, a physician residing in Denver, Colorado. One daughter, born 1915. Divorced 1928. Married fellow artist Paul Ludwig Gill (1894-1938) in 1928. From 1928 until 1982, resided in English Village, Wynnewood, Pennsylvania, in an English Tudor home that contained studios for both her and her husband. Known primarily as a portrait painter. 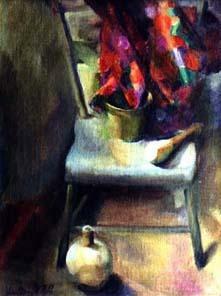 Also painted still lifes and landscapes. Took one year of sculpture at Academy and executed several bronzes and portrait heads in plaster. Her work generally fits into the Post-Impressionist, representational tradition. Awards: Cresson Traveling Scholarship, PAFA , 1992; First Toppan Prize, PAFA, 1923; honorable Mention, Ogunquit (Maine) Art Center, 1931; Edith Penman Memorial Prize; award, NAWPS, 1932, and first prize, Fall Exhibition, NAWPS, 1933; Fellowship prize, 128th annual exhibit, PAFA, 1922; prize award, Women's Achievement Exhibition, Philadelphia, 1933; Lanscape prize, Plastic Club, 1942; First medal, Philadelphia Sketch Club, 1942; Landscape Prize, Art Club of Philadelphia, 1944; First Prize, Wayne Art Center, Wayne PA. Her work may be found in the permanent collections of the: Allentown Art Museum, PA; Art Gallery, Fort Worth TX; Pennsylvania Academy of the Fine Arts, Philadelphia, PA; the Woodmere Gallery and Museum, PA; Lancaster County Art Association, PA; Millersville College, Millersville, PA; Everhart Museum, Scranton, PA; Auburn Museum, Auburn, NY, The Plastic Club, Philadelphia, PA, along with other locations.